Manfred Steger’s work opens up a new perspective on money and globalization. Numerous studies on globalization emphasize the increasing interconnection of global financial markets. 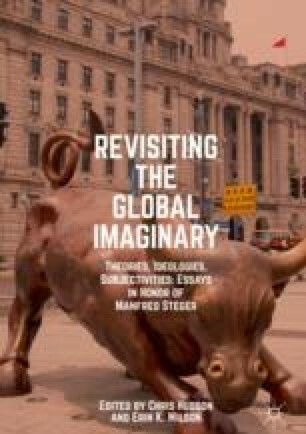 Building on Steger’s insights, this chapter shifts from markets to money and from the global North to the global South to analyze the processes of globalization. Innovative methods for the global transfer of money in recent years have contributed to greater social and financial inclusion. Women, though still not as included as men, have gained greater freedoms related to money. Migrants send money more efficiently to their families and communities in the global South. The chapter concludes by considering the implications of the globalization of money for future global, social, political, and economic relationships. It suggests the family will become increasingly central to money and the global imaginary. Alampay, Erwin, and Charlie E. Cabotaje. 2013. The Use and Impact of Mobile Money in the Delivery of Conditional Cash Transfers in the Philippines. http://www.imtfi.uci.edu/imtfi_2013_alampay_cabotaje. Accessed 7 Apr 2014. AlphaPoint. 2015. Caribbean Startup Bitt Secures Seed Round USD$1.5 Million in Capital Led by Avatar Capital, to Bring Digital Currency Financial Services to Emerging Markets. Globe Newswire. http://globenewswire.com/news-release/2015/03/30/720132/10126774/en/Caribbean-Startup-Bitt-Secures-Seed-Round-USD-1-5-Million-in-Capital-Led-by-Avatar-Capital-to-Bring-Digital-Currency-Financial-Services-to-Emerging-Markets.html. Accessed 2 Apr 2015. Bandyopadhyay, Tamal. 2017. The Big Dreams of Small Finance Banks: Eight of the 10 Entities That Received RBI Licence to Start Small Finance Banks Are Now Operational. How Have They Been Doing? liveMint, May 22. http://www.livemint.com/Opinion/KXZuCsCdGrCrqsrCdfQZ8K/The-big-dreams-of-small-finance-banks.html. Accessed 28 Nov 2017. Banerjee, Shweta S. 2012. Building India’s Model of Agent Banking. CGAP. Last Modified 6 June. http://www.cgap.org/blog/building-india%E2%80%99s-model-agent-banking. Accessed 27 Sept 2012. Banerjee, Abhijit, Pranab Bardhan, Esther Duflo, Erica Field, Dean Karlan, Asim Khwaja, Dilip Mookherjee, Rohini Pande, and Raghuram Rajan. 2010. Help Microfinance, Don’t Kill It. Indian Express, November 26. http://www.indianexpress.com/news/help-microfinance-dont-kill-it/716105/0. Accessed 23 Sep 2012. Bansal, Samarth. 2017. Aadhaar Row: Activists Say Workers Under Rural Scheme Will Be Denied Jobs, Govt Denies. Hindustan Times. 20 April. https://www.hindustantimes.com/india-news/aadhaar-row-activists-say-workers-under-rural-scheme-will-be-denied-jobs-govt-denies/storyqpdRp8Rai1GqqYifwfZYPM.html. Accessed 26 June 2018. Bhattacharya, Pramit. 2017. How Demonetisation Affected the Indian Economy, in 10 Charts: The Potential Benefits of Demonetisation Are Not Clear Yet, But the Costs Are Clear. liveMint. http://www.livemint.com/Politics/ySbMKTIC4MINsz1btccBJO/How-demonetisation-affected-the-Indian-economy-in-10-charts.html. Accessed 28 Nov 2017. Camner, Gunnar, Caroline Pulver and Emil Sjöblom. 2009. GSMA (Global System for Mobile Communications Association). What Makes a Successful Mobile Money Implementation? Learnings from M-PESA in Kenya and Tanzania. https://www.gsma.com/mobilefordevelopment/wpcontent/uploads/2012/03/What-makes-a-successful-mobile-money-implementation.pdf. Ehrbeck, Tilman. 2014. CGAP (Consultative Group to Assist the Poor). Microcredit Impact Revisited. https://www.cgap.org/blog/microcredit-impact-revisited. Accessed 3 June 2017. ———. 2012. The Search for Inclusion in Kenya’s Financial Landscape: The Rift Revealed. Centre for Development Studies. Last Modified March. http://www.fsdkenya.org/pdf_documents/12-03-29_Full_FinLandcapes_report.pdf. Accessed 19 Aug 2012. Khan, Saif Ahmad. 2017. Demonetisation Will Have a Big Impact on Non-essential Items Like Magazines: Paresh Nath. Delhi Press, March 3. http://www.exchange4media.com/print/demonetisation-will-have-a-big-impact-on-non-essential-items-like-magazinesparesh-nath-delhi-press_67935.html. Khandker, Shahidur R., and Hussain A. Samad. 2014. The World Bank Development Research Group Agriculture and Rural Development Team. Dynamic Effects of Microcredit in Bangladesh. Policy Research Working Paper 6821. 1–48. http://documents.worldbank.org/curated/en/456521468209682097/pdf/WPS6821.pdf. Kishor, Sunita, and Kamla Gupta. 2009. Gender Equality and Women’s Empowerment in India. National Family Health Survey (NFHS-3), India, 2005–06 http://dhsprogram.com/pubs/pdf/OD57/OD57.pdf. Accessed 17 Aug 2017. Millward, Steven. 2017. They Want to Bring Cryptocoins to the ‘Unbanked’. Techinasia. https://www.techinasia.com/telcoin-money-transfers-cryptocurrency. Accessed 5 March 2018. ———. 2017b. National Family Health Survey, India 2015–2016 (NFHS-4) Woman’s Questionnaire. http://rchiips.org/NFHS/NFHS4/schedules/NFHS-4Womans.pdf. Accessed 17 Aug 2017. Moyo, Admire. 2017. Vinny Lingham, Llew Claasen Back Start-Up, Wala. Web IT, October 10. http://www.itweb.co.za/index.php?option=com_content&view=article&id=165498. Peyton, Antony. 2016. MasterCard and Western Union Boost Bangladesh’s Mobile Money Transfers. Last Modified 19 April. http://www.bankingtech.com/475842/mastercard-and-western-union-boost-bangladeshs-mobile-money-transfers/. Accessed 2 Nov 2017. Scharwatt, Claire, and José Sanin. 2017. Guidelines on International Remittances Through Mobile Money. GSMA (Global System for Mobile Communications Association). https://www.gsma.com/mobilefordevelopment/wp-content/uploads/2017/09/GSMA_September_2017_Guidelines_On_International_Remittances_Through_Mobile_Money.pdf. Singh, Supriya, and Yaso Nadarajah. 2011. School Fees, Beer and “Meri”: Gender, Cash and the Mobile in the Morobe Province of Papua New Guinea. Institute for Money, Technology and Financial Inclusion. http://www.imtfi.uci.edu/files/imtfi/blog_working_papers/working_paper_singh.pdf. Accessed 20 Sept 2012. Suri, Tavneet. 2017. Testimony of Professor Tavneet Suri. MIT Sloan School of Management. Before the U.S. House Committee on Foreign Affairs “Beyond Microfinance: Empowering Women in the Developing World”. Last Modified 12 July. http://docs.house.gov/meetings/FA/FA00/20170712/106233/HHRG-115-FA00-Wstate-SuriT-20170712.pdf. Accessed 12 July 2017. The Economic Times. 2017. Objective of Aadhaar Is to Include, Not Exclude: Ajay Bhushan Pandey, CEO, UIDAI. June 11. https://economictimes.indiatimes.com/opinion/interviews/objective-of-aadhaar-is-to-include-not-exclude-ajay-bhushan-pandey-ceouidai/articleshow/59087404.cms. Accessed 26 June 2018. The Economist. 2017. The High Economic Costs of India’s Demonetisation. January 7. https://www.economist.com/finance-andeconomics/2017/01/07/the-high-economic-costs-of-indias-demonetisation. Accessed 26 June 2018. World Health Organization (WHO). 2017. Violence Against Women: Intimate Partner and Sexual Violence Against Women. World Health Organization, Last Modified November. http://www.who.int/mediacentre/factsheets/fs239/en/. Accessed 25 November 2017.